Sad news to pass along today, on the same day that Pirate pitchers and catchers report: former Pirate pitcher Jim Bibby has died on Tuesday night of undisclosed causes at the age of 65. Bibby started Game 7 of the 1979 World Series for the Bucs and got a no-decision, throwing four innings and yielding the only run in a 4-1 win that would seal the Pirates' last World Series victory. His best season came in 1980, when he went 19-6 with a 3.32 ERA, earned his only All-Star nod and finished third in All-Star voting. Bibby threw a no-hitter with the Texas Rangers in 1973 and nearly threw a perfect game for the 1981 Pirates, surrendering a leadoff single to Atlanta's Terry Harper and then retiring the next 27 in a row. Bibby, the brother of former UCLA Bruin basketball star Henry Bibby, is also the uncle of Mike Bibby, veteran guard of the Atlanta Hawks. 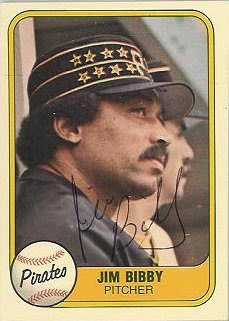 Bibby began his career in St. Louis in 1972, was traded to Texas in 1973, and signed with the Pirates as a free agent in 1978. He spent five years in Pittsburgh, ending his career with Texas once again in 1984. He finished with career marks of 111 wins, 101 losses, 19 shutouts, and 5.6 strikeouts per nine innings.